What if billboards could do more than just advertise a product or service? What if that 14 by 48 foot surface usually reserved for clever copywriters and amazing artists could also be used to deliver a much needed resource to a nearby community? 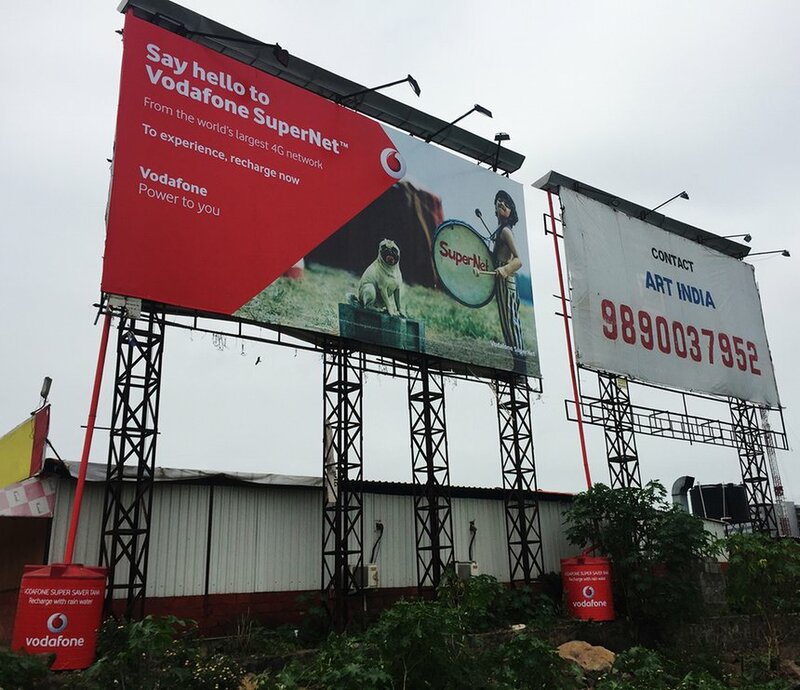 It seems that Vodafone was thinking along those lines when they created the rainwater harvesting billboard – a billboard that not only advertises their telecom services but also collects and stores rainwater. These billboards, located in Pune, in the Maharashta region of India, are helping farmers in the drought-stricken village of Pimpri Sandas. The billboards are fitted with a trough on the top of the billboard that collects and funnels rainwater into storage tanks for distribution to the farmers. But then Vodafone did what really smart companies do – they took this innovative, socially-minded idea and connected it to their brand and their business. Each water storage tanks is fitted with a unique Vodafone SIM card with embedded water sensor technology. Once the storage tanks are full, a text message is automatically sent out to the mobile phones of the members of a 24/7 collection team. The water collected in the tanks is transferred to water tankers and delivered to the farmers in Pimpri Sandas. What a terr ifically ingenious idea. Congratulations Vodafone for using the power of your brand and your ingenuity to do more than just advertise your product. It’s this kind of thinking: a highly scalable, simple solution applied to a very big problem that is going to help us make progress toward reaching the Sustainable Development Goals. Well done Vodafone. Your rainwater harvesting billboard helps to address SDG #6: Clean Water & Sanitation: Ensure availability and sustainable management of water and sanitation for all. This is fantastic! I agree, good on Vodafone for thinking differently. Great blog idea. I can’t wait to see more. Thanks very much for reading my blog! glad you like it. Many thanks for sharing a simple yet innovative and inspiring idea. Looking forward to the next one! Keep them coming, with thanks.